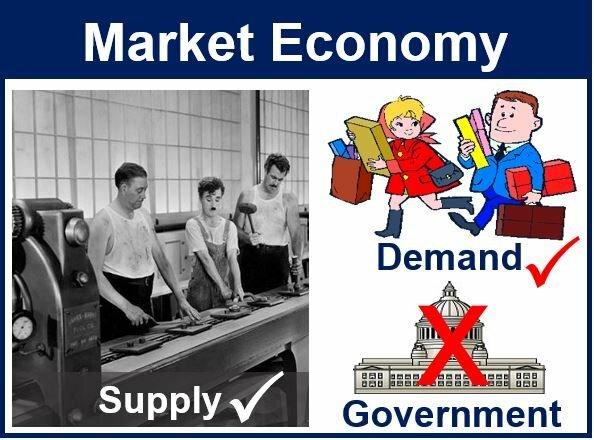 A market economy is one in which prices are established according to supply and demand, rather than by the government. All decisions regarding salaries, investment, production, and distribution are also based on supply and demand in a market economy. It is also known as a laissez-faire economy. In a market economy, investment decisions and the allocation of producer goods are principally made by negotiation through markets, in contrast to a planned economy, where production decisions are embodied in a production plan. Although the majority of rich nations today claim to have market economies, they are, in fact, mixed economies, i.e. a blend of market forces driving activities plus government intervention and control. In a market economy, in its purest form, supply and demand determine everything, and not the government. In the United States, for example, the postal system belongs to and is run by the state, as is its military establishment. The building and maintenance of highways in America is the responsibility of the government of each state. Several companies in the US belong to the state, including Amtrak (passenger railroad service), Anacostia Waterfront Corporation, Commodity Credit Corporation (protects farm income and prices), Corporation for Public Broadcasting (promotes public broadcasting), and Freddie Mac (aims to expand secondary market for mortgages). Since the global financial crisis of 2007/2008, many major companies were bailed out by the taxpayer in the advanced economies, effectively turning them into state-owned corporations. The Edinburgh-based The Royal Bank of Scotland Group plc. became owned by the British government after the financial crisis. Without a bail-out by the UK taxpayer, the financial institution, which before 2008 was the largest bank in the world for a brief period, would have collapsed completely and perished. There is significant debate today across the world regarding how much governments should intervene in the private sector in order to stabilize the economy. All 35 members of the OECD (Organisation for Economic Co-operation and Development) claim to be market economies. For a market economy to function successfully, certain laws are needed to prevent distortions and abuse. For example, predatory pricing – reducing your prices below cost of production in order to kill off the competition so that you can establish a monopoly – is not allowed. This video talks about Adam Smith, who said that the market – supply and demand – should determine the economy and not the state.